KDE is the desktop environment I have liked for a long time. One of the first distributions installed on my computer was Kubuntu 10.04, and one of the first articles on Linux notes from DarkDuck blog back in 2011 was a comparison of KDE and GNOME. I come back to KDE-based distributions every now and again, and Kubuntu 16.04 currently runs on my personal laptop. I received several emails and comments under various articles asking me to review KDE Neon. The time has now come. KDE Neon is a distribution created by the KDE team featuring the most recent version of KDE (Plasma) desktop environment on top of Ubuntu core. Effectively, you have something similar to Kubuntu, but with bleeding edge KDE technology, a few versions higher than Kubuntu. There are 4 versions of KDE Neon available for download on their web site: User current, User long-term support (LTS), Developer stable and Developer unstable. Only 64-bit images are available. Even the LTS versions have new images updated frequently. The most current non-LTS verion had the date 20170907 (the 7th of September 2017) in the filename at the moment when I downloaded it. The ISO image is 1.7 Gb in size and available to download only from the KDE Neon site. I downloaded the image and "burnt" it onto the USB stick using the usual method: command dd. The USB drive is in the port of my Dell Inspirion 17. Reboot. Choose to boot from USB. Let's go! As long as KDE Neon is based on Ubuntu, you can expect the booting process to be similar to Kubuntu. It is the fact indeed. You only have one question during the boot, and it is a choice between the Live (Try) and Installation modes. I chose to run the Live version of KDE Neon 20170907. Once the boot sequence finished, I ended up on the empty desktop with a KDE-style wallpaper in blue, green and yellow tones. The only icon on the desktop is for the system installation. There are no alternative wallpapers. The panel is at the bottom of the screen. It has no quick shortcuts, but only a menu button with KDE logo on the left and a notification area on the right. The latter contains the more or less usual set of indicators: clocks, battery, network, bluetooth, volume and so on. The freshly booted KDE NEon system took about 468 Mb of memory, which is on par with Mageia 6 KDE and slightly more than Linux Mint 18.2 KDE or Kubuntu 17.04. On the technical side, my version of KDE Neon ran on Linux kernel 4.10.0 from Ubuntu 16.04.1, KDE Plasma 5.10.5 and KDE framework 5.37. KDE Neon correctly recognised my wireless network card and configured it automatically. I had to click the network indicator on the panel and select my home WiFi network. The only "but", which is usual for KDE, is that the network password entered in the network indicator window has no effect. You have to re-enter the password again in the subsequent pop-up window. KDE Neon comes with the English US keyboard layout by default. I use English UK and Russian layouts, so I had to change the layout to my taste. The process of configuring these is the same in KDE Neon as in many other KDE distributions. KDE Neon comes with a set of application out of the box that is next to none. This is what I saw in Bodhi Linux some time ago and was very disappointed with. Even though the KDE Neon distribution is based on the bleeding edge KDE software, I realised that 245 applications had to be updated in my Live system, which weighted 143 Mb. Many of them were KDE-native tools like Dolphin or Okular. Of course, I did not run this update. Firefox 55.0.2 is the default and the only browser available out of the box in KDE Neon. Apart from it, the Internet section of the menu has no other applications. Okular is the only representative in the Office section of the menu. Yes, your guess is rights: KDE Neon comes without LibreOffice, KDE Office, AbiWord or any other office suite. The graphics sections... yes, you're right! It is almost empty as there are only Gwenview and Okular applications. The Utilities section, usually full of different tools, only has 4 applications listed: Vim, Ark, KWrite and Spectacle, the KDE screenshot utility. There is a Developer menu section, and it contains some developer tools for Qt5. VLC is the only item listed in the Multimedia part of the menu. No K3B, no audio controls, nothing at all! As you can see, the set of applications is scarce to say the least. Of course, you have all the Ubuntu repositories just under your fingertips, but one may expect at least some basic applications to be included in the default distribution. Why not to have LibreOffice? Why skipping K3B? The idea is not clear to me. Just to check the installation process, I tried to install the K3B application. You can do it from a command line (sudo apt-get install k3b) or from the Discover software centre. The installation took me literally few seconds, and K3B appeared in the menu. However, it could not be used straight away: cdrtools package was missing. And it was not listed as a dependency for K3B. If you still don't get the idea from above, I will phrase it myself: once you go for KDE Neon, you will need to build your system yourself from barebones. Even though KDE Neon does not have many applications, it comes with VLC player available out of the box. It immediately sorts out all issues with multimedia playback. I was able to play local MP3 and video files without any additional steps. 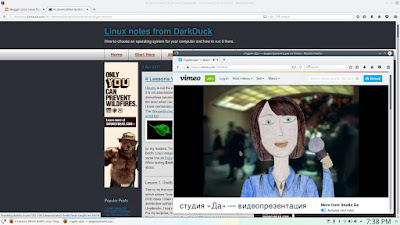 Firefox was also able to play videos from YouTube, Vimeo, CNN and 1tv.ru without any hiccups. I had nothing to complain about the technical part of KDE Neon Live run. It was smooth and fast. There were no glitches or unexpected delays (apart from one - I cannot remember the exact details). However, the lack of the very basic software makes me stop from recommending this distribution to the beginners. It may be a good distribution for those users who know their way in the Linux world well, who are confident in what they need and how to get it themselves. Do you recognise yourself in the first or the second category of Linux users? Video used on screenshot: https://vimeo.com/15950692. I have been running KDE Neon for about a week now. No issues at all (once I switched out the AMD video card for a Nvidia one). Nice interface, clean look, no surprises. I like it being a little more minimal. It had PHP 7.0.2 or something installed which had some issues until updated. Great build! 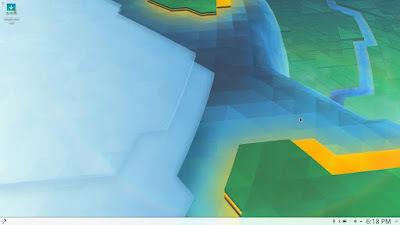 Been using KDE since the glorious 2.0 days...I confess I have tried just about all other DE, specially for my 2005 laptop, but I always come back to KDE..and now Plasma 5 is running smooth, I feel quite cozy with KDE (a painless switch compared to jumping from 3.5 to 4.0). I can only complain of the longer boot timed compared to Xfce or Mate...but I'm hoping LxQt matures enough this new year to replace my Xfce spins for old hardware. Keep up the good work, Duckie! My pleasure! BTW, a review of LXQt-based distro is coming soon. Stay tuned! Maui is a version of Neon which comes with just about everything that you could desire. Why not give it a try. Why not break the habit of a lifetime and actually install a distro for once? Reviews from a live settings are pointless. I have tried Debian (KDE) and Mint (Cinnamon, Xfce) installed beside Kubuntu, from 2009 to 2016, and I think this was good to learn with differences. Now, with 10 installed distros and learning more. May be it is not practical as you need to test & write, but a very good comparison, to use in alternate days. Neon has been installed since June 2016 and worked fine (better than Debian, for me), until accidentally delete it. Reinstall has been not so good. I don't miss apps, as I have already a check-list to remember what to install after every new distro installation. I did note lacking apps, and I felt glad to lack most of KDE-PIM, so did not need to uninstall it (as I have to do in all other installed distros). Conclusion: it may be good to have less. At the end, Neon is not a "distro", but a KDE implementation upon a base (Ubuntu). I'm a newbie and feeling very comfortable with KDE Neón. I'm still on the process of abandoning the M$ World. I like that I have to look for the programs that I like. This way I'm forced to test many programs. That's fun for me. I know I'm late to the discussion...so...apologies. As it relates to Linux based - my first foray was with VMWare in the early 2000s. I was intrigued. Today, enterprise anyware is fairly MS-centric, but at home ... I play with KDEs Neoon. GUI-centric...but the terminal that won't die, neither will my 2007 laptop. Thanks Mike! I'm happy you like KDE Neon, and it works well for your pretty old hardware! I have been using KDE Neon for roughly three months. Currently, running the latest stable release. It is fast and very light. I don't see any of the crazy CPU spikes or heat issues I did with Ubuntu or other flavors. With respect to preinstalled software lacking. I agree it isn't for the total newbie, but what Linux desktop is? One positive is that going through Libre or Open Office, etc. directly gets you the latest build. It is also a teaching moment that will ultimately have to be learned. I have had only one issue that bugs me to death. The password/token ring isn't recognized by certain programs. Example, I am a electronic discovery analyst for a law firm and my email must be highly encrypted. My personal domain email is routed through a ProtonMail server which requires a bridge app to work within Thunderbird. It will not recognize KDEs password manager as a valid ring. I have a work around, but work arounds shouldn't be needed. That is just one example. I have half a dozen more. Outside of that, this is my daily driver. Simple, fast, and can be made to look stunning. Thanks for sharing, Edwin! I'm happy you found the distro you like!